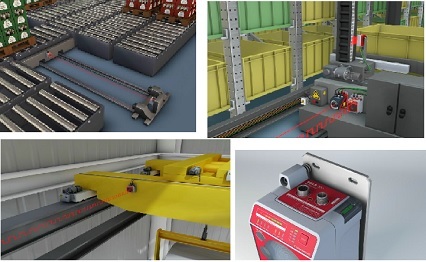 Optical data transmission photoelectric sensors make it possible to wirelessly transmit the data in industrial networks from moving system parts in conveyor systems, such as high-bay storage devices, gantry crane bridges or side-tracking skates, and to do so without interference over long distances. Devices available on the market up to now require a not insignificant amount of effort for alignment and adjustment during commissioning on site and permit only local error diagnostics. The new DDLS 500 from Leuze electronic now combines ex-cellent performance data such as 100 Mbit/s real-time transmission over a dis-tance of up to 200 m with a world first: by means of remote diagnostics through the use of an integrated web server, all relevant data can be called up world-wide. The new DDLS 500 optical data transmission photoelectric sensor from Leuze electronic con-vinces through its simple usability – not only during commissioning and alignment, but above all through the new possibility for location-independent remote diagnostics: Thanks to the integrat-ed web server, specialists worldwide – regardless of where their desk is located – can call up all information needed for the analysis of error messages on a machine or system. To put the ma-chine or system back into operation as quickly as possible, specialists no longer need to travel long distances and personally perform the diagnostics on-site. Rather, they can initiate mainte-nance work remotely and can accompany and support the maintenance personnel accordingly. Especially as the internationalization of companies increases, the possibility of remote diagnos-tics via web servers represents a large time and money savings and makes the new DDLS 500 optical data transmission photoelectric sensor an economical, efficiency-increasing, central network component. To monitor availability and performance reserves, the received signal level is monitored constantly. In this way, it is possible to provide an early warning of an impending failure caused by excessive soiling, for example. In addition to the received signal level LEDs on the control panel, the prefailure message is also available as a signal. All warning messages which may signal an interruption of the transfer are displayed in real-time and in the DDLS 548i version, actively transferred to the control using process data as a Profinet participant. For quick and simple on-site diagnostics, the DDLS 500 has a status LED visible from afar for displaying warnings and errors which further simplifies maintenance and diagnostics. The described new technical features significantly distinguish the new DDLS 500 data transmission photoelectric sensor from Leuze electronic from all devices previously available on the market in the area of optical data transmission and thereby make it a world first. Wherever cable-connected systems are pushed to their limits for communication, data trans-mission photoelectric sensors transmit the data of industrial networks contact- and wear-free with invisible infrared laser light. Here, two devices are located opposite each other, whereby one device is usually stationary at a fixed position while the device opposite is mounted on a moving system part (pictured top left). The infrared laser communicates bidirectionally. In this way, dis-tances of up to 200 meters can be bridged without the need for cables. The new DDLS 500 links Ethernet networks through optical data transmission with a bandwidth of 100 Mbit/s. Sup-ported and transmitted are all common Ethernet protocols such as PROFINET, Ethernet IP, EtherCAT, Ethernet TCP/IP or Ethernet UDP in real time up to a distance of 200 m. Typical areas of application are lifting and travel axes in high-bay storage devices (pictured top right) as well as side-tracking skates used in conveyor systems, gantry bridges and indoor overhead cranes (pictured bottom left). Through the modular basic design, the devices can be selected flexibly and, depend-ing on requirements, according to needs and combined with the basic module. Thus, the devices always perform exactly those tasks that are required – at the best price/performance ratio for the user. The adaptability to applications already begins with the selection of the operating range: the DDLS 500 is available for distances from 0.1 to 200 meters. This makes the devices ideal not only for short distances, but also for systems that span over larger areas. Optionally selectable is a laser alignment aid that is perfect for longer distances. It projects four clearly visible laser spots parallel to the optical axis down onto the ground, making horizontal alignment extremely simple and intuitive. Another useful function module is an integrable device and front cover heater for sensors that are used in cold stores or outdoors. Every DDLS 500 has a pre-mounted mounting plate with spring-loaded wobble ele-ments which allows simple mounting and alignment of the device (pictured bottom right). Align-ment screws make horizontal and vertical alignment of the devices to each other extremely easy. The person performing alignment simply turns an alignment screw until the four flashing spots are each aligned at the same distance to the guide rail or system. Vertical alignment is carried out using a integrated level and also by turning a second alignment screw. A laser spot then clearly indicates the position at which the opposing device must be mounted. Thanks to the patented single-handed ad-justment (SHA) for one-man alignment, the data light beam can be precisely aligned by just one person. Fine adjustment using the SHA method is supported by self-explanatory monitoring of the received signal level in the control panel on the front of the housing. For greater distances there is the convenient laser alignment aid al-ready described above. Leuze electronic presents a genuine innovation with the new DDLS 500 data transmission photoelectric sensor: all relevant data of the DDLS 500 can be called up using remote diagnostics. The data transmission photoelectric sen-sor links Ethernet networks using optical data transmission with a bandwidth of 100Mbits/s and is thus part of the central network component. The devices transmit all common Ethernet protocols such as PROFINET, Ethernet IP, EtherCAT, Ethernet TCP/IP or Ethernet UDP in real time up to a distance of 200 m. For quick and simple on-site diagnostics, the DDLS 500 has a status LED visible from afar for displaying warnings and errors. This makes simple maintenance and diagnostics possible. Through the modular basic design, the devices can be arranged flexibly and depending on needs regarding operating range, remote diagnostics options, heating as well as an integrated laser alignment aid. An integrated level and the pre-mounted mounting plate with spring-loaded wobble elements make alignment simple and only require one person. Leuze electronic holds the patent for this single-hand adjustment pro-cess. All warning messages which may signal an interruption of the transfer are displayed in real-time and in the DDLS 548i version, actively transferred to the control using process data as a Profinet participant.